The winter time is a great time to come to South Lake Tahoe. Our location is convenient to be able to walk to the Heavenly Gondola for skiing, ski rental shops, restaurants, shopping and gambling.Lake Tahoe has always been a gathering place for people seeking peace, adventure and rejuvenation, the Holiday Inn Express, South Lake Tahoe is the perfect starting point to explore this idyllic location.During the winter months, there are multiple ski resorts you have access to from our location. We sell tickets to Sierra at Tahoe ski resort for your convenience. 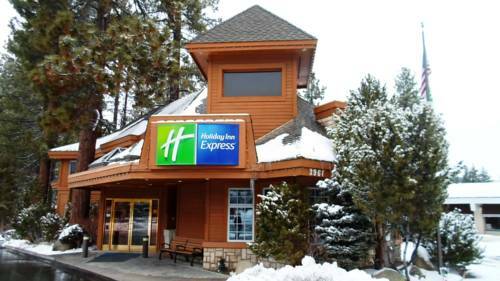 If you're not into skiing or snowboarding, head to Stateline, the home of Nevada casinos like Harrah's and Harvey's, which is just a half mile from our South Lake Tahoe hotel.Take advantage of the Holiday Inn Express, South Lake Tahoe's indoor spa and sauna to end the night. We offer a free hot breakfast bar, available every morning. Take that into consideration when planning a trip into our town. For a great experience, make reservations today at our South Lake Tahoe hotel!